All of it is just a step away. So why wait, just give it a shot. Moodle Site Url : Enter your Moodle website url here. By doing this, your Moodle website will get preconfigured to your Moodle mobile app. Only a Moodle website url can be entered in this tab. App Name : This will be the name by which your Moodle mobile app will be identified at Google Play store and Apple App store. This could be name of your organisation, you website name, or anything that you want to be known with. Users will search your Moodle app with that name to download and continue with their learning. App Description : This will be a short description of your app on Google Play store or Apple App store.It gives a brief about what your application does. App Icon : This will be the icon for your Moodle mobile app, which will differentiate your app from all others. This could be your company logo or any other image. A distinctive and meaningful icon makes your app easily recognizable at Google Play store and Apple App store. 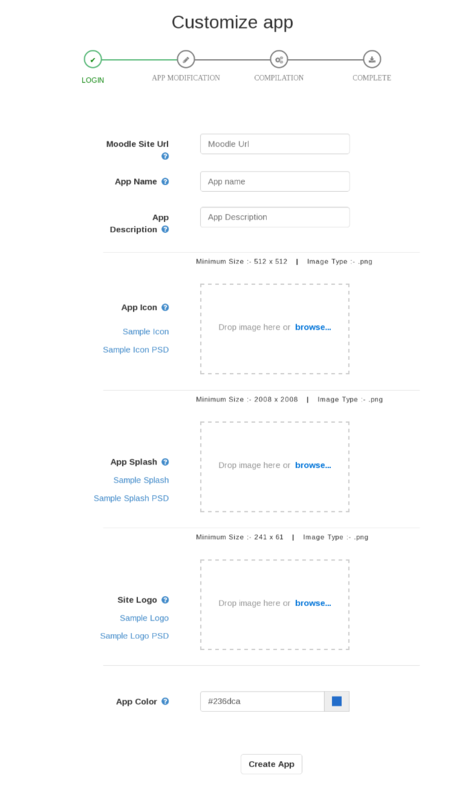 App Splash : This screen appears for very short time when a user is entering the Moodle. This appears when the app has started and is loading. Site Logo : Splash screen is followed by site logo, this will appear on welcome screen. App Color : This becomes the color of your app. Like orange is the color of Moodle mobile app, you can select any color to compliment your app. 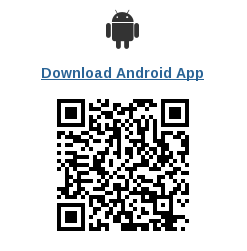 Through android app link appearing above QR code imageInstall downloaded app on your mobile.